Spiral sliced ham is a precooked ham which has been previously sliced in spiral manner for the purpose of serving the ham slices conveniently. This manner of pre-slicing lets cutting sections of the ham and ready to serve if desired. By doing one uninterrupted cut around the ham, spiral cutting is achieved beginning at one end and moving continuously around the ham towards the other end. This process will create slices that will have uniform thickness all the way through. Baking and serving a delectably tender and juicy ham can be made easy using spiral sliced hams since you no longer have to bother yourself on slicing the perfect portion of ham for your visitors. The uniform slices from the spiral cut ham can be served right away after being taken out of the oven. There is practically little preparation and basting required and the ham will come out juicy and tender after baking. Throw away any juices in the package after taking out the wrapper. Discard the plastic disc used to cover the bone on top of the ham because it is only placed there for outward show and has no use in the cooking process. In a baking pan, put the ham meat side down. The slices will be held in place firmly when the flesh is down while cooking the ham. This will also help prevent the meat from drying up. Pour one-half to three-fourths cup of water to the bottom portion of the pan. Use aluminum foil to cover the pan and ham loosely then fold the edges to the brim of the pan. If baking in a roaster, monitor the ham closely to avoid drying because roaster will cook the ham faster. Bake the ham for 10-12 minutes for every pound in an oven with 350 degrees temperature. Generally, the ham is already fully cooked and only needs heating in order to enhance the flavor and release the natural juices. 5. 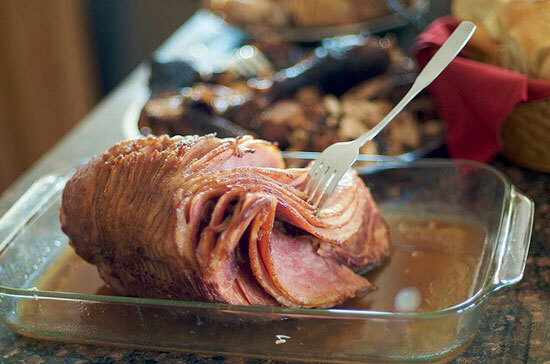 To retain the flavor and keep the ham moist, baste with ham juices in an interval of twenty minutes. Ten minutes before the ham is done, apply the glaze which comes mostly in packets. To prepare the glaze, you may need to mix it with water. You can also use pineapple or orange juice as a substitute for water if you want to have a tastier glaze. To have a nice caramelized ham, brush the glaze throughout the ham’s surface then bake without cover for the remaining ten minutes. Take out from the oven then set aside for 10-15 minutes to cool. Make a vertical along the bone to cut whole slices away. Arrange the ham slices on a platter along with your favorite condiments.